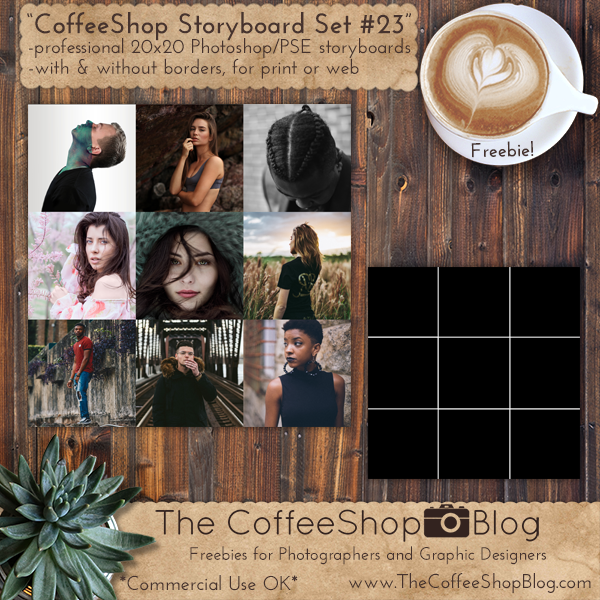 The CoffeeShop Blog: CoffeeShop Professional Storyboard Set #23, 3x3! CoffeeShop Professional Storyboard Set #23, 3x3! Today I have a brand new professional photographer storyboard set. This one contains two nine-photo storyboards (with and without white borders) that are 20x20 inches and can be printed or posted on the web. These storyboards are layered psd files so you can add your images using clipping masks (tutorial and free action). Make sure you check out my loading action, it really makes loading these multi-image storyboards quick and easy!!! Original Images from Unsplash used in this post (woman in black shirt, girl in hat, girl with pink flowers, guy on train bridge, girl in field, guy by wall, blue face guy, cornrow style, girl in bathing suit). Download the CoffeeShop "Storyboard Set #23".